The 9.45am Mass will commence at 9.30am in the Parish Centre. The 11.00am Mass will commence at 10.50am in the Parish Centre. The 12.15pm Mass will begin at 12.30pm in church. This Mass takes place in Westminster Cathedral at 12.00 noon, and is celebrated by the Cardinal, Bishops, Priests, Deacons, Religious and Lay Faithful of the Diocese. At this Mass the oils of Chrism, Catechumens and the Sick, are blessed and consecrated for use in the parishes in the coming year. 8.00pm: Tenebrae, will be sung by the choir Cantores Missae. Tomas Luis de Victoria’s Responsories (psalms) will be sung, with English translations provided and interspersed with reflective readings from the saints. Ideal for a prayerful entry into the Sacred Triduum. 8.00pm: Mass of the Lord’s Supper, also with the washing of the feet. 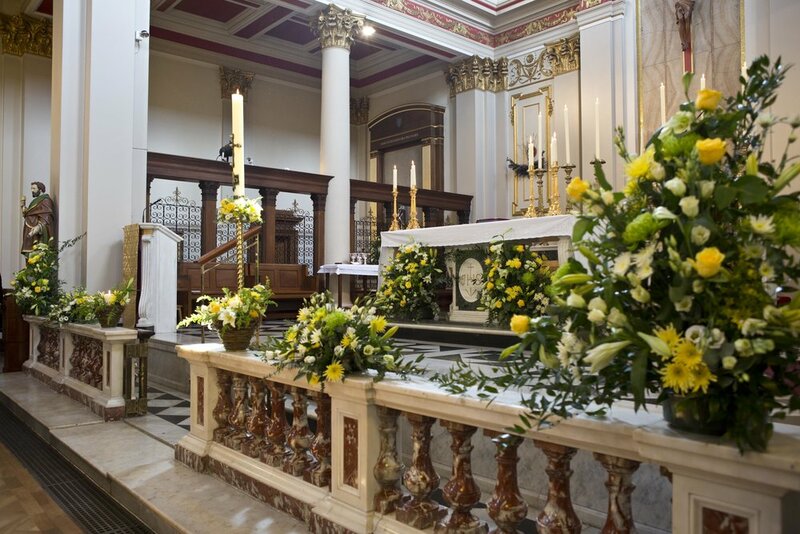 After Mass there is Watching at the Altar of Repose until midnight with Compline at 11.50pm. 9.00am: Office of Readings and Morning Prayer. 11.00am: Children’s Liturgy of the Stations and Veneration of the Cross. 3.00pm: Solemn Commemoration of the Lord’s Passion. 9.00pm: The Solemn Easter Vigil. Masses at 8.30am, 9.45am, 11.00am, 12.30pm (not the normal 12.15pm), and 6.30pm. 12.00 noon Mass only. Church opens at 8.00am throughout Easter Week. Thank you to those who have generously donated to our parish Lent Project, which is supporting Lepra and The Cardinal’s Appeal. So far, £8,315.78 has been donated. The Cardinal’s Appeal is focussing on London food poverty, another great cause to support.